Eco Hosting Review 2019: Is Eco Hosting a Good Hosting? For more than ten years, EcoHosting has provided customers around the world with Linux web hosting, VPS, dedicated services, and reseller plans. Their customers enjoy personalized 24/7 support, and high performance courtesy of SSD-powered hosting services. Chile-based EcoHosting Internet (or simply ‘EcoHosting’) provides shared hosting, VPS, and dedicated servers to more than 10,000 local Chilean and other Latin American customers. Powered by solid state drives (SSDs), their servers are fast and reliable, while their control panel is easy to use. EcoHosting offers high availability hosting services across all their hosting plans by leveraging high-quality SSD servers with RAID 10 controllers. Shared hosting is pretty fast, while their VPS and dedicated servers are four times faster because users don’t share resources. And for your peace of mind, EcoHosting carries out free daily backups (local and external) of all websites and data. Thanks to the RVsitebuilder website builder with 200+ templates, anyone can build and deploy a functional website within minutes. For a database-driven website or a CMS website or store, you can use the Softaculous app installer that comes with more than 400 scripts. Their choice control panel for shared hosting, VPS, and dedicated servers is the popular cPanel. Simple and easy to use, this web-based tool lets you administer your hosting account remotely. You can create emails, add and assign rights to users, monitor resource usage, upload files, and create and manage MySQL databases, subdomains, and SSL certificates. Very few hosting companies offer free hosting for NGOs and non-profits, but EcoHosting does so as long as you have a certificate of registration and verified SII registration number. Hundreds of NGOs already rely on Ecohosting’s cloud services. EcoHosting offers a range of flexible and fairly-priced hosting packages with some nice features. VPS activation is instant while dedicated cPanel servers take about 1 hour. It’s easy to upgrade as they don’t tie down customers with contracts. All their plans are also risk-free because they come with a 30-day money-back guarantee. 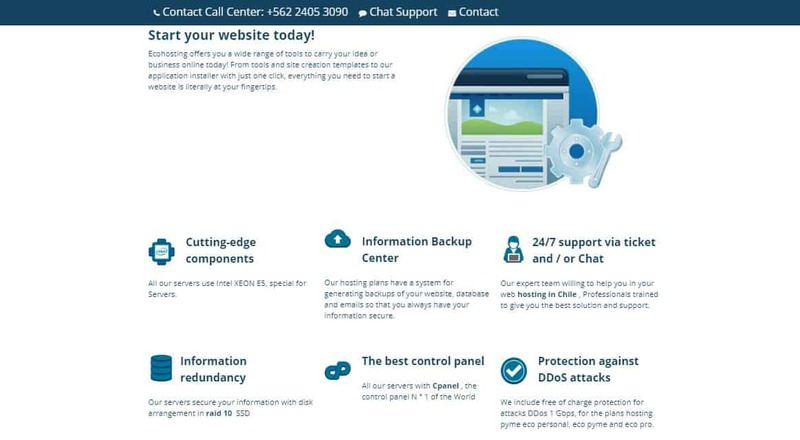 Spanish-speaking customer care and technical support specialists are available 24/7 to answer your questions and resolve your hosting issues via email, live chat, or telephone. From what I’ve seen of online reviews, more than 90% of EcoHosting’s customers seem to be satisfied with the level of support that they receive. onClick="trackClickout('event', 'clickout', 'Vendor Page - Visit User Reviews', 'Eco Hosting', this, true);"
I've been using eco-hosting for 5 years and they are brilliant. The support and advice they give is spot on and swiftly delivered. I have two VPS and 3 shared hosting sites with them and the performance has always been rock solid. When I've asked for addition php modules to be enabled they have responded positively. In short I am so happy I chose to go with them. If you’d like to get a foothold of the vibrant Chilean online marketplace, EcoHosting can make light work of it thanks to their high-performance SSD-powered hosting with 99.9% uptime guarantee. Wondering how Eco Hosting stacks up against other Web Hosting companies? Enter any other Web Hosting company and we will give you a side-by-side comparison.